Who’s Coming Up on Monday, March 14? EKK 2017 – Here We Come! Last week Monday when Malie foundation took over the EKK program, Nathan announced that their goal was to raise $3,000 that evening. He also promised that if they hit $5,000 like they did the previous year, he would shave his beard. When the dust settled and dollars counted, the grand total in donations reached $6,000. The biggest surprise was that they designated the donations to support EKK 2017! To make good on his promise, Nathan got up on stage tonight and let Onio shave off his beard and mustache as promised. Only Nathan can….! Topping off the good news, two snowbirds who always sit in the front row next to each other, both named Walter, each donated $500 toward EKK 2017 because they have been coming to EKK for years and appreciate the program because it gives them so much to look forward to whenever they are on Kaua`i. Exemplifying our elation over such enthusiastic support from our loyal audience was a weekly attendee at EKK, Sager the Caregiver Doggy who always sits in the fourth row. As conductor of the Royal Hawaiian Band for 24 years, as conductor of the Honolulu Symphony simultaneously for seven years, as conductor of the Hawaiian Ecumenical Choir for 36 years, and as Conductor of the Kamehameha School Alumni Glee Club, Aaron Mahi had to research all the music they covered in great detail, so today he is a walking repository of information about all the songs that they have played, sung and performed to audiences great and small here in the islands and on the continent. Here he sat on the EKK stage to share a tiny bit of the mountain of information that he must have accumulated over the years. His head is so packed with information that he often jumps from what he is talking about to a related topic. For example, when he was explaining about how to pronounce kiawe (trees), he reminded everyone to be sure not to say Keawe which was the name of a chief, then went on to talk about the genealogy and background of that Ali`i. You really needed to pay attention to stay on his train. Before he sang each song, he shared the meaning of the lyrics and described the emotions within each song. One love song in particular was about the husband and wife who shared a love that was so deep that Aaron found words woefully inadequate to describe the depth of their love, so he amped up the emotion in his voice and gestured frantically with his hands to try to show how very deep this love was between the couple. While teaching Kipu Kai to the papa `ukulele, that turned out to be like a bunch of folks sitting in his living room as he shared in his very upbeat style — chord progressions, strums, etc., — he not only talked about the history of the private estate of the late Jack Waterhouse, but also Jack’s passion for the Hawaiian language and the songs that he had passed down through the late Bill Kaiwa who traveled the world as a Hawaiian music singer. He even asked Jill Kouchi to share her experience growing up as a teenager in this remote and inaccessible paradise. For her, the paradise was at that time in her life a prison and not easy living because there was only rainwater, no phone, no television, no electricity so all homework had to be done before nightfall, and there was no place to hang out with friends. As hanai sister of Bill Kaiwa and Kama Yim, both of whom had grown up as Jack Waterhouse’s sons, Jill remembered that Mary Kawena Pukui, originally from Ka`u on Hawai`i Island, was a frequent guest of Jack Waterhouse because Jack took Hawaiian language lessons from her. She had penned the song Kipu Kai directly into the guest book that everyone signed when they visited the home. So her lyrics about Mount Ha`upu, the long white beach, and the strutting peacocks were from her experience of being in that very special place. Maddy Lam put music to those descriptive lyrics. Pukui, together with Dr. Emory, were major forces in saving the Hawaiian language. Vicky I`i, a musician with Hawai`i Calls, always spoke about Jack’s eloquent `Olelo Hawai`i and what a pleasure it was to hear him speak. Aaron comes from that generation of singers who made a major impact on the renaissance of Hawaiian music. His classmates at Kamehameha School were Dennis Kamakahi, Kalena Silva, Glenn Silva and others who went on to make significant contributions to the world of Hawaiian music. He acknowledged their greatly admired music teacher and mentor who guided and nurtured all of them when they were young crazy musicians. Bob Springer, who was present at EKK on this night, was for many years the headmaster at Island School here on Kaua`i. Along with the 1971 grads of Kamehameha School, the Brothers Cazimero, also attendees of Kamehameha, were forces in the world of Hawaiian music that changed the way music was shared with the world. Today, their contributions have rippled throughout the universe in ways that have touched so many lives and will continue to do so in the future. Aunty Malia Craver, a guidance counselor at QLCC, passed on to the younger people much of what shaped their direction in this venture. George Kuo went to Kalani High School while Aaron went to Kamehameha School. Since 1998 they both have been playing music in a program called Kanikapila Sunday where many musicians come together, loosen their strings and play music in the old Hawaiian style. Aaron began by welcoming everyone in Hawaiian. He started the program with an oli in Hawaiian that was so powerful it reached all the way back to the food concession table – calling their ancestors to be here with all of us today. That is the way it is done, when it is done properly. Whenever he sang, his presence was very powerful and commanding. The entire evening felt so comfortable and casual as they both came dressed informally in aloha shirts and Bermuda shorts. George invited everyone to sit back, relax and loosen their strings after a long hard day at work. They sang and played a lively jazzed up version of Ka Ua Loku, a famous Kaua`i song by Alfred Alohikea, one of the four royal composers. George taught this song about Hanalei in the `ukulele circle. Their deep booming power voices harmonize beautifully, accompanied by George’s wonderful pa`ani on his unusual 12-string guitar with two necks. These two musicians do not fool around when it came to delivery; they just “geev-um!” Volunteers in the wings were caught up with the music and danced to their lively beat. Aaron shared a song from the westside, from Kekaha to Port Allen, where many of the families from Ni`ihau settled. In Ahe Nani Niihau by Aunty Emalia and her two nieces, the poetry is so simple and beautiful with the hidden kaona. While speaking about the tangible, often referring to the `aina, they are actually speaking about something intangible or about the people in their lives. In the song Emalia describes the setting sun turning the sky into a brilliant canvas of many brilliant colors. She speaks of the beauty of Ni`ihau represented by the rare Kahelalani shells found on their beaches. She mentions Wai`ale`ale, Nohili, Ha`upu — the wahi pana or special places of Kaua`i — but she was actually talking about members of the family and what they meant to her. George shines with his pa`ani played on the upper neck of his double-neck guitar. Myron Cummings, son of Andy Cummings of Kaua`i, loved Pua Mamane, a naughty frisky song about some unexpected “encounters” with a bit of falsetto. These two musicians have such an upbeat and lively style of singing. I just loved, loved, loved the way they sang the Hawaiian songs. Aunty Nainoa from the westside of Kaua`i passed a beautiful love song down to Bill Kaiwa. It describes when another is so much a part of you but couched in words about caring for the land. Kupa means one who is of that area, and `Aina is more important to us than we realize; it exudes out of the experience of the people; we can actually eat the land. Aaron’s description of the lyrics of the song was so passionate that he was beside himself for the want of words adequate enough to describe the feelings hidden in the song. He talks about winds, the blossoms so pungent to the nose, passion burning so hot inside for him or her. It’s quite an experience to watch Aaron get caught up so emotionally as he describes the meanings in the words. His explanation of being in love was so passionate; you can’t help but be swept up into the mood of love. Andy Cummings often sang a lively version of Kupa `Aina with Johnny Almeida. Johnny often called out to the audience about all this love stored in this repository of love for all of you. Aaron would get soooooo excited and carried away as he described how Johnny loved to play with the words and expressed the emotions in the way they sang their songs. Cazimeros were their contemporaries. Aaron described the Cazimero’s recording of this song as a good interpretation but he really liked the way that Andy Cummings and Johnny Almeida sang it. Andy Cummings, who loved Kaua`i songs, moved to Honolulu and started the first KGU Radio Show. He worked with Ralph Alapai, a young musician who always hung around older musicians and had a beautiful command of `Olelo Hawai`i. Many of the musicians that Aaron spoke about have already passed on, so his sharing about how they sang and played is precious oral history that is right here at EKK being passed on to a new generation of music appreciators. Musicians like Aaron Mahi and the late Dennis Kamakahi are like an encyclopedia of the journey of Hawaiian music. A day spent in their presence is like a semester in a class about Hawaiian music and culture. Kaulana Na Pua, the stone eating song, was written in 1893. Today that song still serves as an important rallying call for issues about the land. Henry Berger told them when they raised the American flag the day after Hawaii became a part of the United States, the Hawaiian people were enveloping the land into their entire being into the lyrics of their songs because everyone was so fearful of the United States taking over our lands. A wedding proposal by Kahoano Lake for his bride to be, Aunty Maiki Aiu Lake, described her as the Pua Lili Lehua. Unlike the Tuahine rains of Manoa which fall all over Manoa valley, the Lili Lehua rains of Palolo, fall only in the back half of the valley and stops when it reaches the front of the valley. Maiki Aiu Lake often visited her friend Sarah Kailikea, the famous kumu hula of Nawiliwili. Just before the intermission, Nathan Kalama came up to the stage to have his mustache and beard shaved off as he promised. George Kuo played some light background music on the Kamoa `ukulele as Nathan carried out his fundraising promise at the Community Hula Night…. All $6,000 worth of it. I shared with the audience that during the first five weeks, we raised $791; Harajuku night we raised $720; Malie raised $6,000 in one hour so that is pretty darn amazing. Dan Buskirk of Gabriela, BC, won the red Kamoa `ukulele. Many Canadians seem to have won the `ukulele this year. During the first half they shared songs about Manokalanipo; during the second half Aaron wanted to share songs and stories about his family. It wasn’t until the 1970’s that Hawaiians began to visit the concept of understanding who we are, where we came from and where we were going; it was part of the Hawaiian renaissance and music was a big part of this. Henry Mahi, Aaron’s grandfather was born in the last part of the 19th century on the Kalaupapa Peninsula. The family lineage is a very important part of the Ali`i. They were asked to move out of Kalaupapa because they were not afflicted with the Hansen’s disease, so they moved to Kalawa`a, on the north side of the Kalaupapa peninsula. Grandmother was also from Molokai on the east end in the remote Halawa Valley, home to the Opiopio Family and Kane Families. Matthew Kane, a wonderful composer who wrote many, many songs such as Ka Makani Ka`ili Aloha, was at that time the Principal of Kipahulu School. He based this song on the legend about the Kipahulu wind that came from the ocean and stole your loved ones away. Aaron’s powerful singing was so moving and passionate. As many times as I have heard this song sung by many different musicians, with the lyrics and the background of the song explained by Aaron, the song took on new meaning. He clarified the words Lei Milimili as something that you have and can feel in your hands and it’s the lei that fills your entire face. His wife was from the Crowningburg family. After having eight children, she left her husband and moved to Waikamilo on O`ahu and had more children from another man and then moved on to another relationship and had more children. Aaron said, “She gave birth to a nation.” She did eventually go back to Kipahulu where all six hundred descendants gather every June to honor her memory. The Kane family will always sing this song about the winds of Kipahulu. Albert Kane, Matthew’s younger brother, was Aaron’s great grandfather. He taught band at Wailea. At that time, Henry Berger, bandmaster of the Royal Hawaiian Band, would find and recruit into the Band talented young boys from the boys’ home in Wailea, to keep them out of trouble. George Kahoano, who had been a student of Albert Kane, was the announcer of the Royal Hawaiian Band. They were all somehow associated with the Royal Hawaiian Band, but Aaron found this out only after he had become conductor of the RHB; it was very much a part of his musical world. He shared a fascinating story about how different members of the family would meet each other for the first time at the performances by the Royal Hawaiian Band and find out how they were related to each other. Through Annabelle Kane, one family member found out that his boss was his nephew. 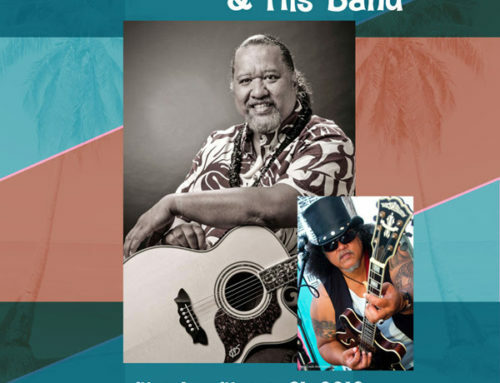 This happens a lot to Hawaiian musicians that they often do not know about their genealogical relationships until they are thrown together to perform at various functions. Aaron spent some time going over the genealogy of the Crowningburg family. It was all too complicated to follow. 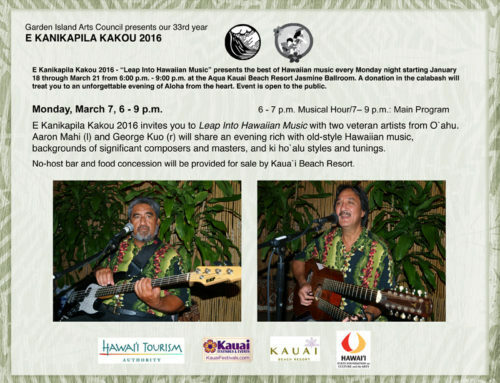 George Kuo shared a number of ki ho`alu songs. His grand uncle Danny Ainoa was a major influence on George. Ki ho`alu is a music that is good for night time; if it doesn’t put you to sleep, it’s not good. Auntie Alice Namakelua would play a song on just one string. She prefers to play the sweet nahenahe style of slack key like Raymond Kane, but she said, “I can jam, too!” and she really could. Manini are like school children, darting in and out all over the place like the black and white fish; he played the Manini instrumental song that was the very first slack key song recorded by Leonard Kwan. He then played the Oldtimers Slack Key from the northern part of Hawai`i Island in Pololu Valley. George worked with a lot of great musicians working for the City and County of Honolulu; he dropped a lot of familiar and unfamiliar names and shared the day jobs of all the musicians. In 1986, he was invited to be part of Eddie Kamae and the Sons of Hawai`i. 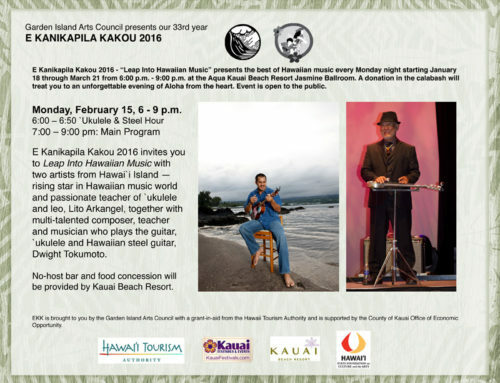 During that tenure he was able to play one of his favorite songs, Manu Kapalulu written by Queen Lili`uokalani, who poetically told children to stay still. Such a lively song. Opihi Moe Moe was a song recorded by Chet Atkins after he came to play golf in the Hawaiian Open Pro Am. Chet played it like bouncing up and down Country Western style. When the Sons of Hawai`i appeared on the Prairie Home Companion show, Chet asked George to choose a song for him to play, so George suggested he play Opihi Moe Moe, a classic ki ho`alu song. Another of George’s favorite Kauai songs is Kaua`i Beauty by Keala Kai because it stood for the most precious lei that George Kuo ever received when he graduated; it had Mokihana berries entwined with maile, a lei he still has today. George shared a story about one of the unforgettable events while playing at the Hollywood Bowl with Aaron conducting the Honolulu Symphony. Among the guest musicians were Dennis and David Kamakahi, Sonny Chillingworth, Keali`i Reichel, and George. At one point, Aaron put down his baton, picked up his bass guitar, and joined the guest musicians in the song. “I was younger then,” quipped Aaron. George played Fred Punohu’s Maunaloa Slack Key. To honor the kupuna who mean so much to us, Aaron wanted to share a song from Kona. It’s a song that is played by the Paris family, one of the early pre-Parker Ranch ranching families. Aaron shed a great deal of new insight on the song Kona Kai `Opua by his in-depth explanation of the lyrics. The song speaks about all the different township in the Kona ahupua`a going from Kona to Keahou, past the area of fresh water springs and the cold winds, to Kealakekua where all the Ali`i are buried, and on to Ho`okena. It’s so great to hear new background information on a song that you hear all the time but about which you don’t know enough; it helps you to learn anew an old song. That is one of the best things about EKK; you can hear a song over and over, but it is never the same because each musician brings new information, new life and new appreciation for old favorites. This 2016 Leap Year season has been an energizing year for EKK. Many unexpected surprises, old favorites, new faces and renewed appreciation for the many loyal supporters of this program who have been really stepping up to the plate to show their support for EKK — unique in the islands and close to the heart of many. EKK 2017 or Bust! Outlets: EKK Mondays; Kaua`i Music & Sound in Kapa`a; Scotty’s Music in Lihu`e; Island Soap & Candleworks and The Wine Shop in Koloa; only general admission tickets left.